EXCERPT. Were you excited when Restoration Games announced the reprint of a very old classic Wolfgang Kramer game Top Race (aka Formel 1)? Maybe you haven’t even heard of it. But Formula One and other racing games always have a special appeal. Reimplemented in 2017 as DOWNFORCE, come drive with us and find out more about this new classic. Most of us are fans of racing games … Back in the Monopoly days, I started my racing games with a much simpler game titled FORMULA ONE from Waddingtons. Now we have the ever popular FORMULA D to the newer FLAMME ROUGE or the much older classic UM REIFENBREITE (SdJ92). Even GMT is included here with their THUNDER ALLEY. Note: Horse and erm Camel racing games omitted from my list above. Ever since Laurent & Eric’s FORMULA DE (now implemented as FORMULA D by Asmodee) raced into the market, things have never been more exciting for this genre than recent years. FORMULA D makes use of dice for movement, and plays in my opinion best with 5 players each controlling a team of two cars (rather than 10 players with one car each). 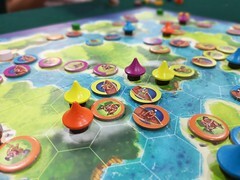 The game is best if you play it with weather conditions and over 2 rounds (since that’ll force the to-pitstop-or-not-stop question) however this format of play takes longer and has downtime between players. 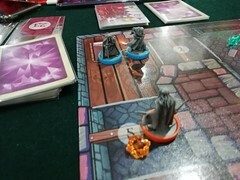 RALLYMAN also uses dice for movement but in an interesting 1-move-per-die mechanic with the dice value being used to assess the risk of loss of control rather than movement points. It’s good to see newer racing games making a switch to card-driven mechanics for movement as it helps to bring the playtime down. In particular, I like the implementation in THUNDER ALLEY and FLAMME ROUGE. But card-driven mechanics for racing games is not new. TOP RACE (the game from which DOWNFORCE re-implements) is an old game from the 80s and it already used card-driven movement. We love Restoration Games’ decision to pick TOP RACE as one of the few titles they are “restoring” this year as it gives the newer gamers the opportunity to experience this classic from Kramer (which has been unavailable for a long time). Let’s dive in and see how this classic holds up in today’s expanded market of racing games. 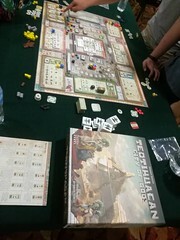 The game plays up to 6 players (our session was 4p) and as with all racing games, the more players the merrier. The first thing to do in the game is to auction off the Race Car / Team Power. There are 6 cars in total; and the team power (special ability card) is matched randomly with the race cars. You are given a set of 10 movement cards. These are the cards you’ll play later in the Race Phase to move the cars, but it’s also used in the Auction phase as bids for each of the 6 race cars. During the Auction phase, the numbers in the card indicate the amount you are bidding for the car of that color. In the Race phase, the numbers indicate the movement points for the cars. The 10 movement cards dsitributed to each player at start of game. My hand shown above has 11 card – the extra is the “Orange-8” card in the middle. This is an additional card added to your hand when you win the bid for a particular race car. After all 6 cars are auctioned off, the game is ready to start the Race Phase. In a 4p game, some players will own more than one car. It’s not really an advantage as the price you paid for each car would be used to offset your VPs at the end of the game. So having two cars – while advantageous in terms of card play – also meant you need to get both cars into strong finishing position at the end of the race. 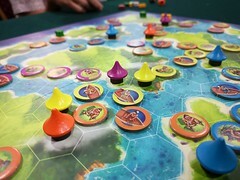 The game comes with a two-sided board so you get two race tracks. We noted one side appears more beginner friendly while the other side looks “tougher”. Sure enough, on the “tougher” track, right off the starting line you get to feel how “nasty” (in a good way) this game can be! The first corner forces all cars to bunched up into a single lane… and since cars cannot hop over each other, that will create a “delightful” choke point! kekeke. There are four such corners in this track. Enjoy! One might think Orange is a runaway winner but in our game, orange ended the race in 2nd position while yellow ended in first. And those who actually bet on yellow would have won more Prize Money points. The winner of this session is Abraham who owned the Yellow car and also bet on his yellow finishing first. The movement points spread in the cards help to balance this runaway possibility. That choke point may result in a car running ahead… but fret no. The movement cards are kinda statistically spread out to balance the movement points across the cars. Orange (above) might appeared in a clear lead but it also meant it has spent more of its high movement cards earlier in the race and vulnerable to be overtaken in the last stretch. Yellow battling it out with Orange for pole position while the others were fighting over another choke point (what else)! Which takes me to the next feature of this game – one that’s not found in Formula D or the other racing games mentioned earlier in this article – ie betting on cars. You see those “yellow lines” on the race track? Those are the “betting points”. There are three of them so you get three chances to bet on which car is going to make it to the podium (1st-3rd). You can bet on any car. Obviously the payout is greater for the bets made in the 1st betting point compared to the last. Each betting payout you win adds to your final VP. So this feature adds another dimension to the gameplay. 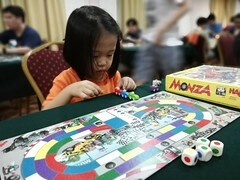 The winner of the game is decided over three areas – 1) Auction Price you paid for your cars (this is a negative contribution to your score), 2) Betting Payouts you win by picking the right car at each of the three betting points, and 3) Racing Payouts for the owner of the cars based on finishing position. This game plays very fast… easily under 40 min. Mixes Racing and Betting payouts in the same game (this reminds me of similar mechanics in TOTOPOLY, a horse racing game from the same era) and you can play either in Friendly mode (with the beginner track and everyone in more cooperative mindset) or Nasty mode (with the advanced track and everyone in a more brutal mindset). The long list of expansion maps is what makes Formula De so popular. What we hope is for Restoration Games to come out with more expansion maps!! Hah. INTERESTED IN THE GAMES MENTIONED? 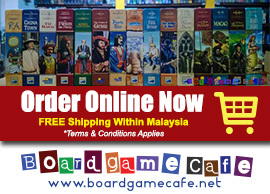 The Boardgamecafe.net webstore has over 1,500+ games with free delivery (min order applies) to anywhere in West Malaysia. 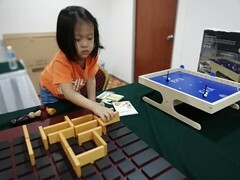 If you are a retail store or boardgame cafe looking to sell boardgames and card sleeves, you are most welcome to reach out to us at partnersales@bgc.